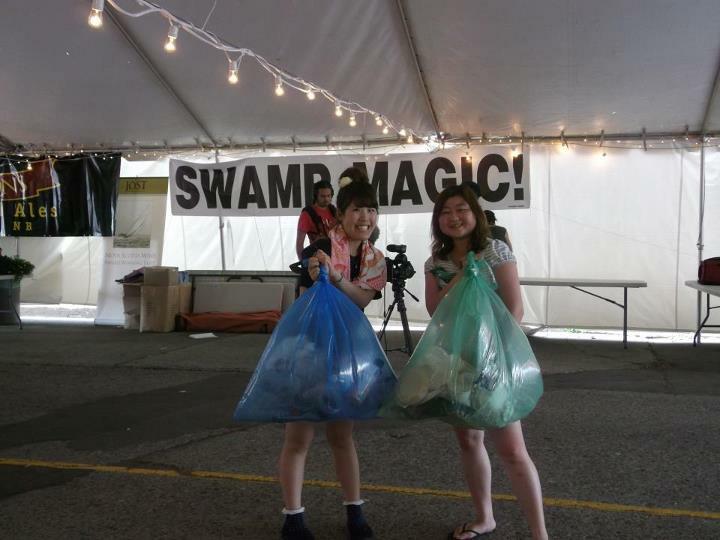 During SappyFest 2012, RCE Tantramar coordinators Emily and Rob worked as heads of the Recycling Crew, educating and coordinating volunteers to facilitate the sorting of garbage into blue and green trash bags according to Westmorland Albert’s wet/dry system. Sackville’s Public Works supplied two dumpsters, one for green/wet and the other for blue/dry. Mary from the Westmorland Albert Corporation set up a booth among the SappyFest vendors, educating festival-goers about the wet/dry system. All in all, it was a slightly smelly, but very fun job! A HUGE thank-you to our volunteers, many of whom were the Mount Allison MASSIE students!